Inthrow was developed in partnership with Chris Fremantle of the Scottish Sculpture Workshop, On the Edge Research and lead artist Gavin Renwick. The Scottish Sculpture Workshop (SSW) is based in the rural village of Lumsden, Aberdeenshire. The challenge posed by the partner organisation was how to forge meaningful connections between the workshop as arts organisation and the local community. The workshop provides facilities for sculpture such as bronze casting and accommodation for artists from around the world who come to Lumsden to live and work for a week or several months. Apart from incidental meetings in the village there had been little meaningful interaction between visiting artists and the local community or between the artists and Lumsden and its surroundings as ‘place’ or context for responsive work. The artist, Gavin Renwick, has developed a practice focused by people’s relationship with the land they inhabit. His research is concerned primarily with the nomadic Dogrib people in northern Canada and their understanding of ‘home’ through traditional knowledge.The project brief for Inthrow began by posing the question about marginal rural land ‘What should we do with a field?’. This was prompted by the retirement of the last tenant farmer in Lumsden to earn his living full time through farming. Gavin’s response to the brief was a three stage proposal of artistic activity. A series of events and bringing two other artists into the project provided a fluid architecture for new work within the village and its surrounding area between artists, inhabitants and researchers. 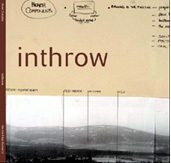 Inthrow chronicles the story of the project through the voices of the village and the artists. 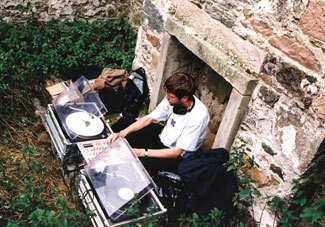 The work by the artists provides a set of new tools for seeing and revealing change in the landscape, for instance, the use of hearth as a metaphor, a living archive, a DJ workshop and related performance in a wild remote place. Photography, diagrams and excerpts of the many dialogues in the web of exchanges in this art project presents a montage of perspectives and artistic tactics. The critical texts by artists and researchers open up the idea of art practice as a process of value finding within the flux of everyday life. A critical issue raised in the publication is the nature of knowledge in practice led art research and more broadly within culture; knowledge not as product, but a dynamic political tool for understanding and shaping change.